The all new AKFST-GS for 2014 has many new features for gunsmiths to adjust any AK-type rifle's front sight. Full range of motion allows you to fully push a sight drum out of the front sight block for repair/replacement. The AKFST-GS of AK-47 front sight tools is a heavy-duty GUNSMITH EDITION of the standard AKFST. It has a larger clamp to handle the most stubborn front sights, and a 6.5" long torque arm to give you even more leverage. No extra tools are required. The AKFST-GS has a limited life-time warranty - if the tool breaks under normal use, send the tool back to Magna-Matic for a replacement (see www.magna-matic-defense.com for full warranty details, terms, and conditions.) The UNBREAKABLE AKFST-GS is 900% stronger than the current generic “C-clamp” type tools. Now with the AKFST-GS you’ll never have to re-buy a front sight tool due to breakage on a frozen AK sight. The AKFST-GS also makes range adjustments even easier, don't let a frozen AK front sight force you to run back to your shop to make adjustments. The AKFST-GS comes in a custom plastic case to keep the tool clean and organized in your range bag, tool box, or tool chest. WINDAGE! The ultra-strong full-circle clamp provides and adjustable set screws allow 100% positive contact to the sight post. 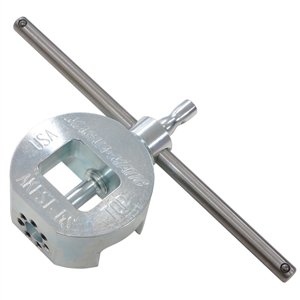 The heavy-duty full-circle clamp and over-sized push rod provides the strength to move the most stubborn frozen sight. Perfect alignment of the drum is easy by viewing the drum through the sight adjustment port of the AKFST-GS. The head of the pusher that contacts the drum is mounted on a ball so that when you turn the T-handle the part contacting the sight drum will not rotate. This prevents any marring against the drum. Our pusher is mounted on a ball, like a single ball bearing (see cut-away images). ELEVATION! The precision machined tip of this adjustable T-handle wrench seats onto the sight post to give you a 100% positive hold on even the most frozen of sight posts. The long lever, which is able to be positioned for greater leverage makes adjustment simple and easy. Note: the T-handle rod can slide to any position to provide more leverage, all images are shown with max leverage. *** CUSTOM CASE - the AKFST-GS comes with a custom plastic case, great for range bags, or keeping your professional AKFST-GS front sight tool clean and organized in your tool chest. All AK-type rifles including Krinkov, Vepr, and Draco. Hardened steel (body and pusher). One set of seven nylon tipped set screws. One set of seven brass tipped set screws. One Allen wrench for set screws. Clear zinc plated for severe outdoor corrosion resistance. Weight 1 lbs 4 oz. Custom plastic case dimensions 8.375" wide x 5.25" tall x 1.875 deep. 900% Stronger than generic C-clamp style units.